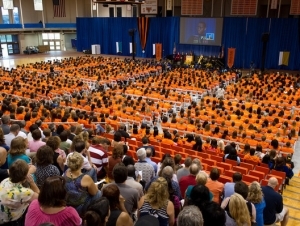 The SUNY Buffalo State community will usher in a new academic year and welcome the Class of 2017 during the First-Year Convocation, Wednesday, August 21, at 9:00 a.m. in the Sports Arena. All members of the Buffalo State community are encouraged to attend. Provost Dennis Ponton and University College Dean Scott Johnson will welcome new students—and their parents—to the beginning of their college journey. Interim President Howard Cohen, who joined Buffalo State earlier this month, will address the audience, as will Dean of Students Charles Kenyon and United Students Government President Eric Sauerzopf. "Convocation provides the opportunity to communicate the standards and expectations we have for students," said Kenyon. "It is important to let students know they have become citizens of a purposeful community, where we expect them to be disciplined in pursuit of their academic goals while being respectful of their faculty and caring toward their fellow students." Additionally, deans of each of the college’s six schools will give an overview of their areas and what students can expect at Buffalo State. A slideshow and overview of First-Year Orientation will also provide audience members with an idea of the campus holds for them. This fall more than 1,320 first-time students are enrolled at Buffalo State. A simulcast of First-Year Convocation is available for those unable to attend.